I see shapes everywhere. Every dirt, spill, cloud, resembles something. 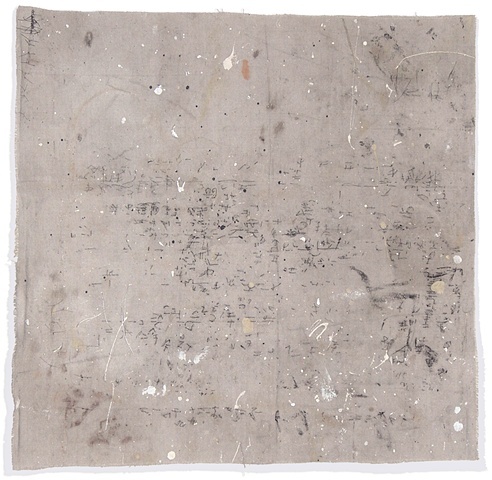 I tell one of such stories: this particular piece of cloth filled with marks as an old scrap of text in forgotten language accompanied by barely visible illustrations. One of them is a boy holding a stick, ready to draw something, (he is) himself made of charcoal-drawn-like line. Maybe one would see in the center a handsome hound-dog composed of strange letters... Well, we all learn different stories while reading the same one, don't we?